Please click below to register. Space is limited for this workshop, and registration is required. Once your registration form is received, we will contact you to confirm your registration. This hands-on workshop focuses on Manual Cinema‘s approach to storytelling and “live cinema” techniques. The workshop begins with an overview of how the company creates shows from story idea to full production. Workshop participants will work with overhead projectors and behind the screens to deconstruct and stage a short sequence from a Manual Cinema show in order to learn the puppetry techniques and cinematic language invented by the company. Participants will then have an opportunity to devise short, narrative shows of their own using the company’s equipment and puppets. The workshop ends with performances by the participants, followed by group discussion and critique. 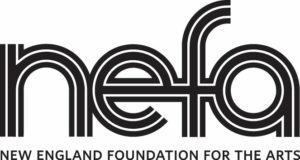 The End of TV was made possible with funding by the New England Foundation for the Arts’ National Theater Project, with lead funding from The Andrew W. Mellon Foundation.